Research reveals the snacking habits of our great nation. Let’s be honest: the only thing better than a huge Sunday night dinner is Sunday football. The game, the tailgates, and most importantly the food are all components that make the American tradition so beloved. 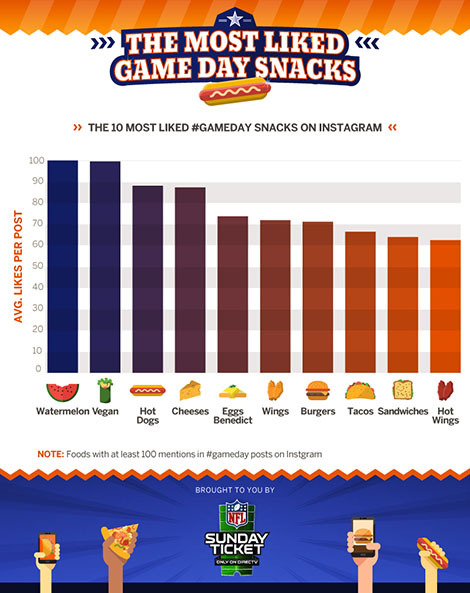 To get a better sense of our country’s snacking habits on this hallowed day, the people over at DirecTV scoured the Instagram world to find each state’s most popular game-day foods. 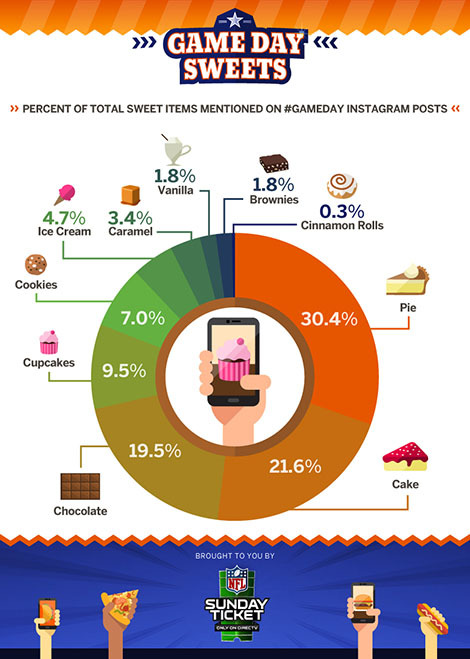 Using the hashtag #gameday, researchers were able to compile data from 25,660 posts from January to October 2015 to determine the most Instagram-worthy foods in terms of popularity. Looks like the secret to a delicious looking burger might be how tan we make it appear. 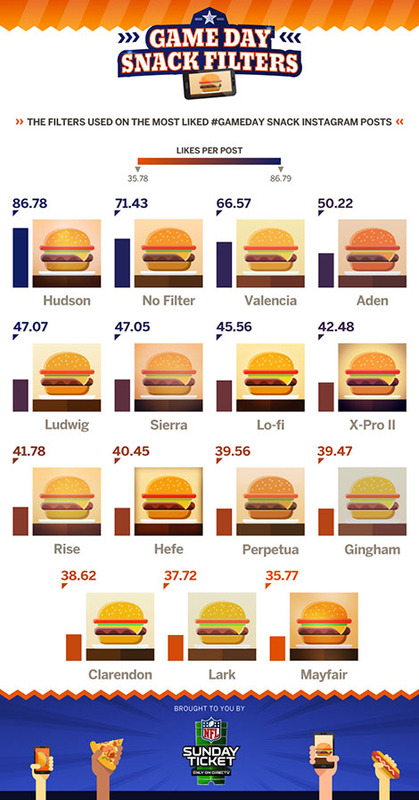 According to the data provided by DirecTV, the most popular Instagram filters used on the posts included Hudson, Valencia, and Aden. Arguably the most shocking data pulled by DirecTV were the findings for the most liked grub. Topping the chats? Vegan food and watermelon. Looks like after consuming all those burgers and hot dogs, people are looking for a cleanse. While some of these game-day favorites will come as no surprise to regular sports fans (burgers, pizza), some states have veered off the beaten path. Who knew that Utah repped pumpkin so hard? If you’re trying to numb the pain of your home team losing, sweets are certainly in order. Football fans’ favorite desserts came as no surprise either: pie, cake, and chocolate. To learn more, head over to DirecTV.